This lecture is given to honor the memory of Julian Cole (1929-1999). He joined the Caltech faculty in 1949 and became full professor of aeronautics in 1959, and professor of applied mathematics in 1967. He was one of the nation's foremost pioneers in aeronautical research and development. He was a pioneer in the development of mathematical analyses of high-speed flows in aerodynamics. The Julian Cole Lecture is made possible through a generous gift from Caltech Alumni Drs. Jain-Ming (James) Wu (MS’59, PhD’65 Ae) and Ying-Chu Lin (Susan) Wu (PhD’63 Ae) who carried out their doctoral research in GALCIT. Through this lecture they honor a professor who has made significant impact in their lives. A review of modern large eddy simulation (LES) for numerical simulation of multi-physics turbulent flows will be presented. Simulations of practical engineering configurations require the ability to handle complex geometries. Extension of LES methodology to unstructured grids through the use of differential filters will be described. A novel adaptation technique is suggested where the mesh (and/or filter) is refined in regions of the flow where estimates of the subgrid scale energy is largest. Applications range from prediction of supersonic jet noise, stalled 3D diffuser, combustion in realistic gas turbine engines and separation control on airfoils. It is demonstrated that in boundary layers the dynamic subgrid scale modeling procedure predicts the location of transition from laminar to turbulent flow irrespective of the path to transition. Development of wall models for LES of high Reynolds number boundary layers, and subgrid scale models for muti-physics phenomena where the dynamics of thin interfaces are critical to the development of large scale flow remains a pacing item for LES. Future outlook for computer architectures and routine use of LES in industrial settings will be discussed. 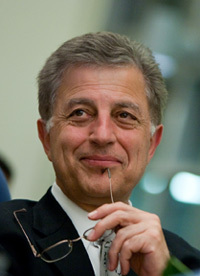 Parviz Moin is the Franklin P. and Caroline M. Johnson Professor of Engineering at Stanford University. He received his Bachelor’s degree in Mechanical Engineering from the University of Minnesota in 1974 and his Master’s and Ph.D. degrees in Mathematics and Mechanical Engineering from Stanford in 1978. He then joined NASA as an NRC Postdoctoral Fellow, and then joined the Computational Fluid Dynamics Branch at NASA Ames as a Research Scientist. He joined the Stanford faculty in September 1986. In 1987, he founded the Center for Turbulence Research (CTR) and in 2003 the Institute for Computational and Mathematical Engineering at Stanford. He is the Co-Editor of the Annual Review of Fluid Mechanics, and Associate Editor of the Journal of Computational Physics, and the Physics of Fluids. Prof. Moin pioneered the use of direct and large eddy simulation techniques for the study of turbulence physics, control and modeling concepts and has written widely on the structure of turbulent shear flows. His current research interests include: aerodynamic noise and hydro-acoustics; flow control and optimization; large eddy simulation; turbulent combustion and numerical methods. Prof. Moin is a member of National Academy of Sciences, National Academy of Engineering and the American Academy of Arts and Science.